As you can imagine, I got very excited. This person had been clocked at over 110 mph at some points. 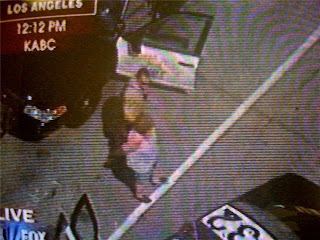 The chase had only been going on for 20 minutes when FoxNews picked it up, so I figures we had at least another 45 minutes to an hour of quality car chase. Needless to say she seemed a bit embarrassed. Shep Smith said this was only the second woman he's seen as the driver leading a chase. All in all the chase was covered for 10 minutes. 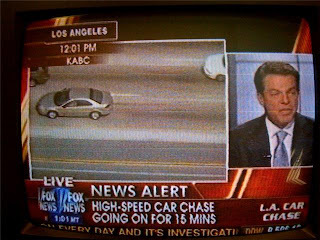 I was very disappointed, but perked up a little when one Fox correspondent said the chase may have been a drill. Shep later reported that the chase started from an unsafe lane change and speed. This lady covered 83 miles in 25 minutes. That's speed the Elsea men would be proud of. Hopefully the upcoming weekend is a bit more enjoyable then the anticlimactic start it got off to. Tonight should not disappoint. My brother's football team is playing Lutheran East from Cleveland. My dad is an alum and well, they're Lutheran. I can't wait to see the look on Mark's face when his sister and brother-in-law show up in the visiting team's shirt.